I had every intention of coming home last night and making enchiladas with some chicken we had left over from the weekend, but as you can see, that’s not exactly what I ended up doing. There was the ice storm. And the train delays. And by the time I finally got home it was VERY late and the last thing I was up for was frying individual tortillas and dipping them in sauce. So I punted, yet again, and ended up with something that had the flavor of enchiladas but was so ridiculously simple to put together I felt like I was cheating in a major way. But it was so good we had two helpings each. It’s amazing how any not-completely-from-scratch guilt just melts away when you’ve got a belly full of something good at the end of a long day. Using 2 tablespoons of butter, generously grease the bottom and sides of a baking dish or cast iron skillet. In another skillet, melt the remaining two tablespoons of butter. Whisk in the flour and allow it to cook for a few minutes, then add the milk and whisk until smooth and thickened. Add a small handful of the grated cheese and stir through. Season with salt and hot pepper sauce. Spoon about 1/4 cup of the cheese sauce into the bottom of the pan or baking dish, spreading it around. Add the shredded chicken to the remaining cheese sauce and stir through. Layer 4 tortillas on the bottom of the baking dish or cast iron skillet over the sauce. Spoon 1/3 of the salsa over the tortillas, then add half of the chicken/sauce mixture, half of the beans, a tablespoon of the oregano and 1/3 of the remaining cheese, distributing them fairly evenly. Cover with four more tortillas and repeat the layering. Top the next layer with the remaining tortillas, salsa and cheese. Bake for 35-40 minutes and allow to rest briefly before slicing. Serve with sour cream or crema and chopped fresh cilantro. 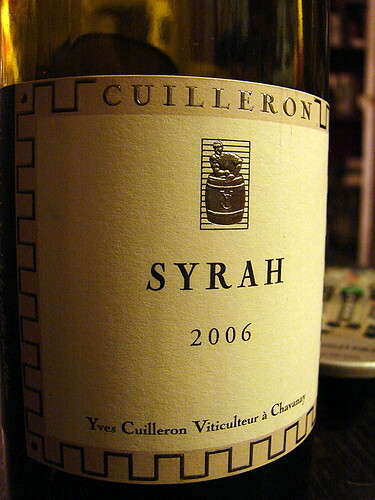 Wine Pairing: We dipped into the mixed case we recently bought, selecting this 2006 Cuilleron Syrah. Mike and I both liked how it worked with our meal – lots of dark fruit and a bit of pepperiness which worked well with the richness and mild spiciness of the dish. Excellent choice for a cold icy night!! When you punt, you definitely punt in the right direction. I love this! When I make this I call it Chilaquiles. When my boyfriend makes this (and he’s convinced he invented it in 1998) he calls it Bachelor Enchiladas. You have inspired me. I’m having this for dinner tonight. I’ll let you in on a little secret: In Mexico, most people make their enchiladas just like you did, or else just with a simple dip-and-fold. And “enchilada” just means “chilied”, after all — you did make enchiladas. angela – Ha! 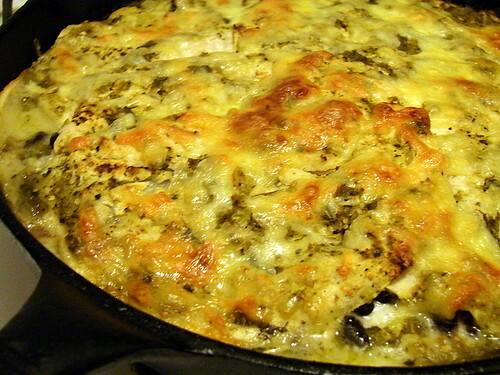 Bachelor Enchiladas – that’s awesome. I’ve TOTALLY done this before and it tastes just the same as a traditional enchilada and hey, it’s quicker and easier! Quite frankly, once you put it on the plate, the presentation was still lovely! 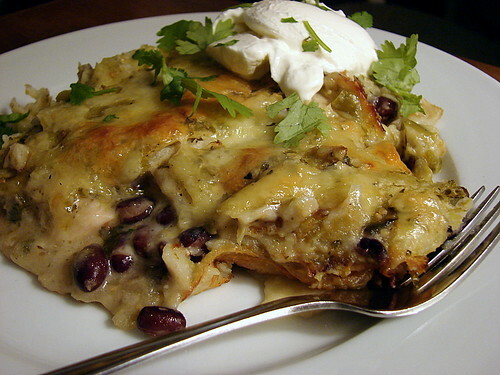 There are few things that are better than a hot chicken enchilada with some cool sour cream on top. 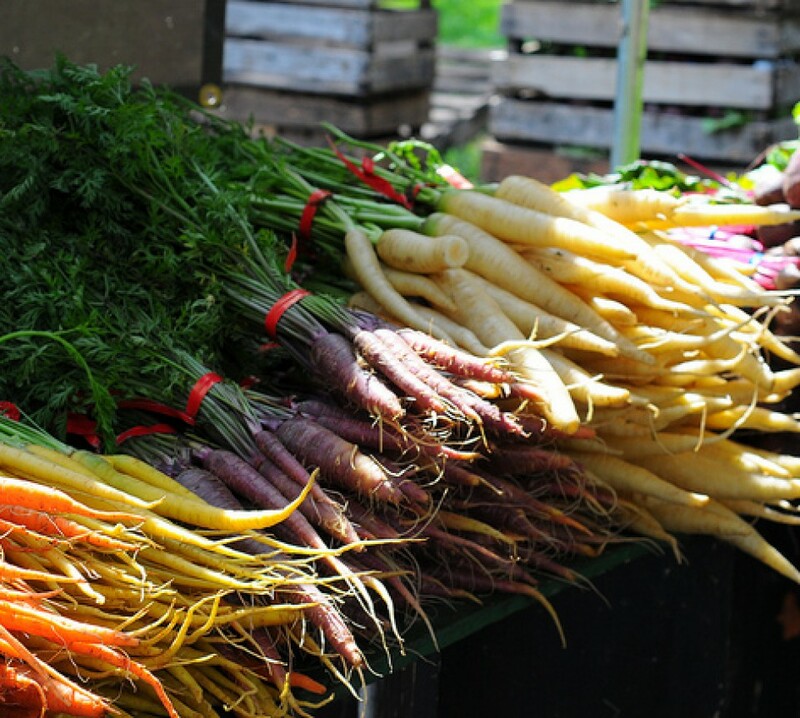 MMmmmmm…..
That looks like a whole bunch of savory goodness! And thanks for the wine pairing advice! Yummy! Looks great. I’ve tried variation of this dish. By the way, I’m going to try the Hunter’s chicken dish tonight. Bit difficult to find the cipollini onions here in Japan (my area at least), so I might try a different substitute. Hillary and simon – Thank you! We loved the wine with this – it’s a really lovely bottle. Tony – Thanks, and I hope the hunter’s chicken works out for you! Your blog has become one of my favorite websites. I find myself looking forward to new postings. I made the enchilada casserole last night and it was so good. Unbelievably good. I made my own tomatillo salsa by sauteeing an onion and garlic, adding a few tomatillos, seasoning with cumin and a bit of chile powder, and then adding a little chicken stock to help it break down. It added a nice tangy bite. Hi Alicia – Thanks and welcome! Thank you for the recipe! It was delicious, and definitely nice for a day when I have a million chores and still want a “nice” dinner on a Saturday night. Thanks again so much!